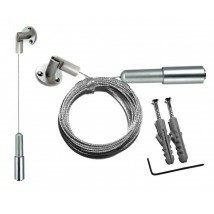 Our floor to wall fixings are versatile and great value for money as the Wall fixing is on a joint that can also be used as a ceiling point. 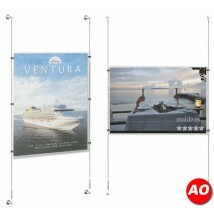 Two options for the price of one! 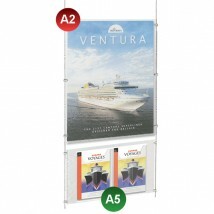 Use these in window displays with a backing board, or fix inside your store to hold poster pockets and leaflet dispensers. 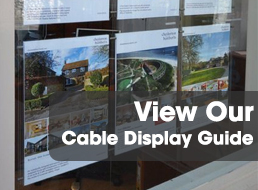 Our cable display systems are ideal for use in estate agents, retail showrooms, opticians, hairdressers, museums and exhibition stands. 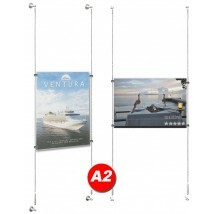 Our cable display systems allow you to combine shelving with graphic panels to create incredibly powerful retail displays. 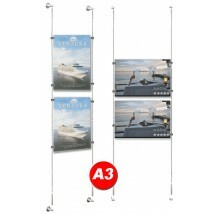 Suspended cable and rod sign display systems are extremely versatile, suspended between floor and wall these kits are ideal for use as window displays or as a partition within a shop. 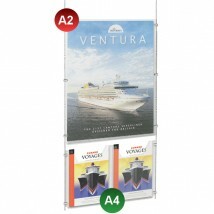 The great thing about floor to wall poster kits is that they can be used in a variety of industries; from showrooms to estate agents. 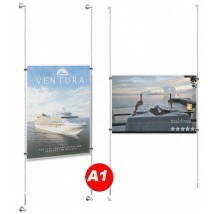 Simply secure one part of the cable to a wall and anchor the other end to the floor. 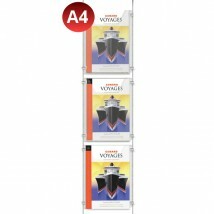 Along with our selection of retail displays and floor to wall cable displays you might also like our Poster Holder Kits, Freestanding Cable Displays,Leaflet Dispenser Kits and Complete Cable Systems. 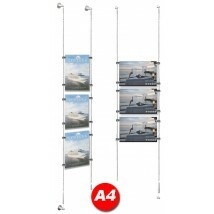 Floor to wall cable display systems from Discount Displays.